As a musician of any experience and ability level, it surely won't have escaped your notice that the concept of time is intrinsic to all forms of music, as language is to literature and colour is to painting. However, ask yourself how much you really think about it, in a truly contemplative sense, as opposed to just figuring out where the taps of that eighth-note delayed lead synth are going to land in relation to your drum track. With the vast majority of modern Western music being composed in 4/4 and adhering to a fairly standard set of unwritten rhythmic "rules" in order to maximise its mass appeal, anything that breaks from the norm and finds its own groove can surely only be a good thing, and when it comes to bending musical time, there are many ways in which this simple goal can be achieved. For loads of tutorials focusing on working with alternate time signatures and complex rhythms, check out the March issue of Computer Music (CM201). For now, here are eleven handy tricks to help you incorporate some unconventional time signitures and radical rhythms in your tracks. There are several tried and tested ways of smoothly segueing into a time signature or tempo change, rather than just instantly switching to it, which can be jarring. One of them is to end the bar before the change with a fill (most likely on drums, but any attention- drawing instrument should be up to the job) that heavily features triplets. The reason this can make for an effective transition is that the triplets work as a disruptive, ear-catching intermediate stage of rhythmic oddness leading into the more obvious rhythmic oddness that follows. Another good way to lead into a tempo change is to again put a fill at the end of the phrase preceding the switch (not necessarily featuring triplets, unless you want it to, of course) and make the tempo change at the start of that bar, rather than the one at the beginning of the new section. This could potentially work with a time signature change as well, if your fill is designed cunningly enough to feel like a transition from one to the other. Or, if you're switching to a "longer" time signature (from 4/4 to 5/4, say), try putting a fill at the end of the transitional bar that just makes up the extra time (one beat in our 4/4-to-5/4 example). When working in odd time signatures with a numerator greater than 4, it can be very helpful to have the metronome emphasise the phrasing of the bar as well as the downbeat - beat 5 in 7/4, for example, or beats 4 and 7 in a bar of 9/8. It's highly unlikely that your DAW's metronome allows for this, though, so why not program your own click track in MIDI, with different sounds, pitches or levels for these emphasised beats, using a sampler or drum machine as a sound source? If you play an instrument but just can't get your head or fingers around playing the thing in odd time signatures, try recording your riffs and other parts in good old 4/4, then creatively cut and paste to edit them into your desired signature. For example, record two bars of a 4/4 guitar riff as you normally would, then chop off the last (or first) beat of the resulting audio clip to turn it into a 7/4 riff of one bar. Obviously, it's more satisfying and effective if you can actually play your odd-time parts for real, but until you get those chops up to scratch, editing in your DAW will do the job just fine. If that odd time signature or polymetric section of your latest track is proving a bit too disorientating, making it hard for the listener to follow the groove, there's no shame in placing an obvious sonic marker of some sort on the downbeat (beat 1) of your pattern or ri­ff - a crash cymbal or piano stab, perhaps. Polymetre, an approach frequently used by Swedish metal outfit Meshuggah, is worth highlighting since it works so well with 'beat-driven' music and has been imitated by so many other acts. Their particular approach often involves the drummer combining time signatures on various elements of the drum kit. For example, with a simple 4/4 rock beat rolling on the hi-hat and snare, a 3/4 or 5/4 repeating ­figure might be placed underneath it on the kick drum(s), with the downbeats accented on crash cymbals. Polyrhythms between individual instruments are one thing, but the drum kit (acoustic or electronic) is essentially a self-contained polyrhythm machine, so make it the f­irst port of call in your mixed-meter adventures. When recording new parts and punching in on existing ones, many musicians actually prefer a straight 4/4 count-in, even when playing in odd time signatures. Fortunately, some DAWs offer the option to tailor the count-in metronome behaviour, enabling you to set up a 4/4 count-in rather than a potentially confusing 9/8 one, say. So, if your drummer is having trouble feeling the downbeat of a 5/4 bar with a 5/4 count-in, try changing the latter to 4/4 and see if that helps. If your DAW doesn't offer that degree of metronome adjustment, you could always place a four-beat MIDI clip just before the punch-in point and route it to a sampler loaded with a metronome-type sound instead. 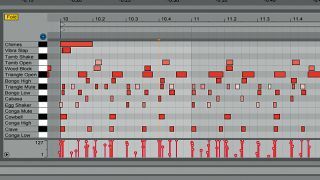 You can create the illusion of using weird time signatures by turning the snap-to-grid function off in your DAW and "avoiding the grid" to whatever extent works for the particular track in question. Even though this won't result in any actual odd time signatures (unless you're incredibly clever in your programming and bloody-minded enough to do it that way rather than actually switching to an odd time signature! ), the effect on the listener will be similar - slightly disorientating and utterly groove-transformative. Classic '90s IDM is often held up as an example of the use of odd time signatures, but actually, a great deal of it is in plain old 4/4. Producers such as Squarepusher, Boards Of Canada and Aphex Twin were just very good at programming MIDI in a way that makes the underlying sequencer grid extremely hard to perceive and follow, often weaving chaotic and intricate grid-shunning drum parts around more conventional synth parts. While virtual instruments and effects automatically syncing LFOs, delay times and other parameters to the tempo of the host DAW is a distinct advantage over their real-world counterparts, it can actually be creatively liberating to turn it off. By running your time-based modulators and processors "free" rather than slaved to the grid, all sorts of polyrhythmic possibilities reveal themselves - running multiple LFOs of a synth at different unsynced speeds, for example, or generating off-kilter, evolving rhythms from a single sound source by running it through an unsynced filter delay. When programming gradual tempo shifts, remember that the transition does not have to be a linear one consisting of a straight line between tempo A and tempo B. Some DAWs have features to create curved transitions between automation nodes, but if not, you can add more nodes along the length of a straight line and adjust their positioning to approximate a curve. While there's nothing wrong with a linear transition, a curve can sometimes sounds more natural or appropriate, so give it a go. Since the vast majority of clips in your sample library will be in 4/4 time, it makes sense to label those that aren't with their time signature - "5/4 Funky Drums.wav", for example. Similarly, within projects featuring time signature changes, labelling MIDI clips by signature can help keep confusion to a minimum.